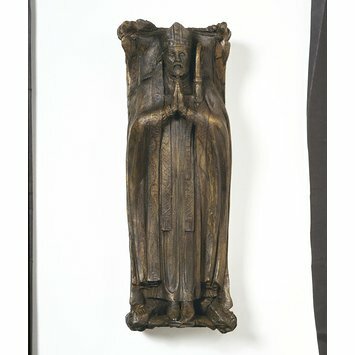 This plasticine effigy is probably the working model for the tomb of Edward Stuart Talbot (died 1934), the first Bishop of Southwark. His tomb in bronze and Hopton-wood stone was erected in the Chancel of Southwark Cathedral, London. The effigy depicts Talbot in episcopal robes with his hands clasped in prayer; at his feet are two lions and the Order of the Garter. On one side is the inscription citing the dates and areas in which he had been Bishop; on the other, the period he spent as Warden of Keble College, Oxford (1870-1888), and Chaplain Ordinary and Vicar and Rural Dean of Leeds (1889-1895) is noted. Three coats of arms are shown on each side, and a coat of arms is also depicted on each end. Thomas (1885-1976) was an English sculptor and medallist. He trained under his father’s gem engraving business in London and at the Central School of Arts and Crafts, London, where he also specialized in gem engraving. After 1918, when he exhibited sculpture at the Royal Academy for the first time, he became active in that field. This seems to be a working model for a tomb. 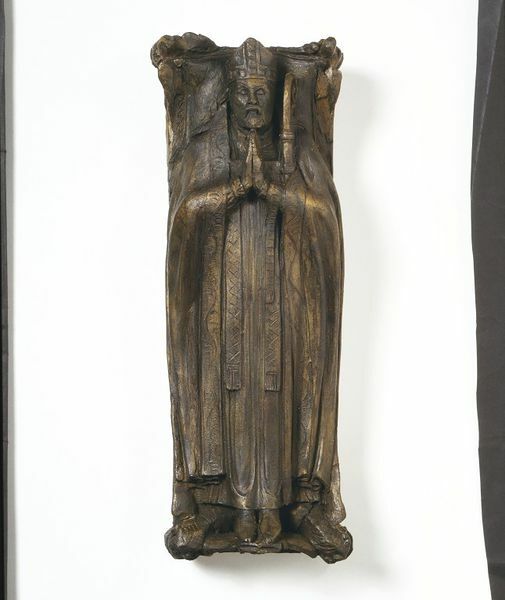 The effigy is portrayed in episcopal robes with his hands clasped in prayer. At his feet are two lions, and the Order of the Garter. On both side inscriptions. Three coats of arms on each side, and a coat of arms is also depicted on each of the ends. Bequeathed by the artist in 1978, together with a few other objects.